Pinć aims to be the poster child of consumer and wallet-friendly VR, and based on the early software, its argument is sound. The hardware, however, isn't comfortable or appealing in prototype. Update: Pinć announced that their case and software support will extend to Android, expanding its once-limited reach to a wide spread of Android devices, including the Samsung Galaxy Note 4, LG G3, HTC One M8, Nexus 6 and more. A few years ago, I was sure that I saw the pinnacle of smartphone case innovations: a smartphone case with a bottle opener embedded in it. Fast forward to 2014 and Pinć, a smartphone case that doubles as a VR headset, is now on its way. From its outer shell, Pinć (pronounced "pinch") is an unassuming case. The current prototype, the first piece of hardware ever designed and assembled by interface software firm Cordon Media, is the size of two iPhones stacked together. The headset's boxy design looks to protests pockets, though the team hopes to trim it down significantly before launch. The eye lenses inside the case pressed uncomfortably against my eyes while it was strapped to my head. I couldn't see anything clearly until I held the unit away from my eyelashes. Setting the lenses deeper into the case, as well as providing an alternative place on the face to rest the goggles will help to solve this. As a standalone case, there's not much to Pinć. But of course, this is no standalone case. Opened up, the ingredients of VR, a head strap and goggles, take stage. So, they're making the iOS and Android experience completely VR-friendly? Nope. 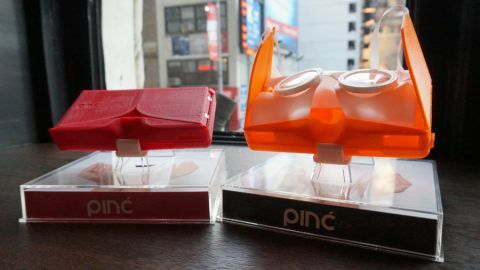 Rather, the Pinć team has a better solution to bring virtual reality to the small screen. Through their Unity-powered app, it operates in a fashion similar to HTC's Blinkfeed, bringing a smartphone user's most beloved content front and center, albeit in a new, fully-interactive way. But why bring VR to mobile users at all? To the Pinć team, the platform was ripe for innovation. Project Morpheus and Oculus Rift each require additional (and expensive) hardware to do the heavy lifting of the VR software, but powerful smartphones, already in the hands of millions, are more than capable to provide a good experience to users. Samsung has made waves in this space with their Samsung Gear VR for the Samsung Galaxy Note 4. Visually, the Pinć app puts you in control of panoramic, interactive cockpit (think Minority Report). You can move your head freely, with the accelerometer inside the iPhone 6 tracking its movement for sensitive, 360-degree head-tracking. The best claim for touch control on modern smartphones is that it's so simple, that even a baby can learn to use it. The team recognizes that simplicity and almost universal understanding and thus, makes the new-age "pinch to zoom" a cinch. To do this, Pinć includes two bands that you wrap around a finger on each hand. Holding your hands in front of you, the smartphone camera tracks the LED and infrared-equipped finger bands. When the camera sees the bands, two dots appear on screen. These are your fingers, which look like mouse pointers. See an item that you want to get a closer look at? Move your arms to hover the two cursors over it and "click" by pressing the finger bands to your thumbs. With that, the rest of the controls mimic familiar touch gestures. Pinć will be releasing the SDK to developers soon, but they developed some fun mock-ups of what's possible. One was a shoe retailer page and I was able to get a closer look at some boots. With a click, the shoe model popped out of the page into closer focus, making it bigger with a outward pinch. A more unique demo allowed me to go apartment hunting by checking out detailed panoramic images of a space. It'll be interesting to see what Pinć offers closer to launch. Cordon Media made clear that there's a time and place for Pinć. It's much more appropriate while waiting in the airport terminal than if you're late for a meeting. It's a new way to experience your content, not a replacement. And with the prototype draining an iPhone 6 battery in 2 hours, you'll definitely want to plan your use of Pinć accordingly. The rough edges of Pinć prototype won't appeal to tech fashionistas, but with Cordon Media's aim for a $99 CAD launch, which is about $88 (£70, AU$102), it's hard to deny the appeal of such a cheap entry-point into virtual reality. With a tentative 2015 release, a bit of polish on its already impressive software will round out the offering. Now, let's just hope that get that hardware in order before launch. If it manages to produce a more comfortable headset, Pinć has the potential to become a formidable opponent in the mobile VR space.